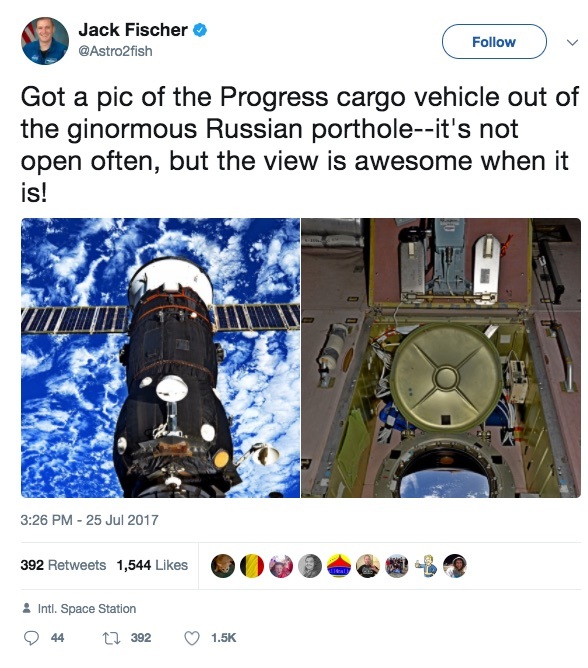 This tweet from Expedition 51/52 astronaut Jack Fischer admires the great view straight down from the ginormous Russian porthole of the Progress cargo vehicle on the ISS. I don't really understand where this porthole is. 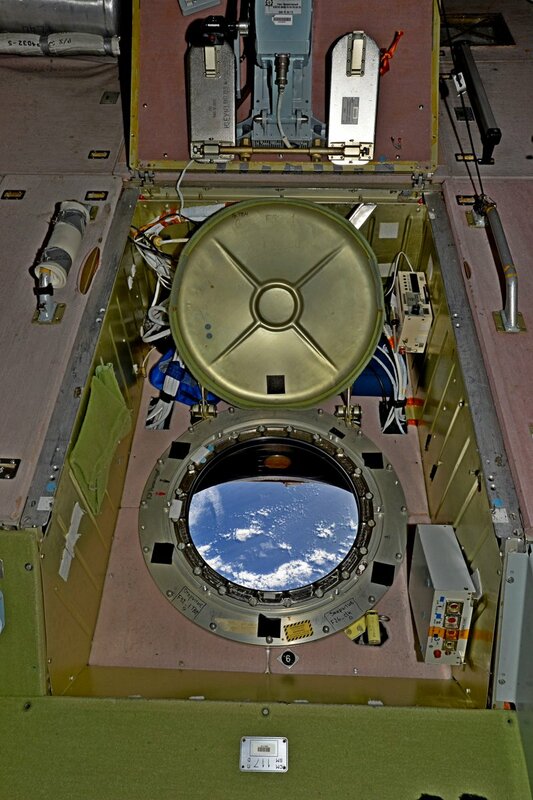 Is it the porthole part of a docked spacecraft, or is it a permanent part of the ISS? Is this the same direction that the center, round window of the ISS's Cupola faces? 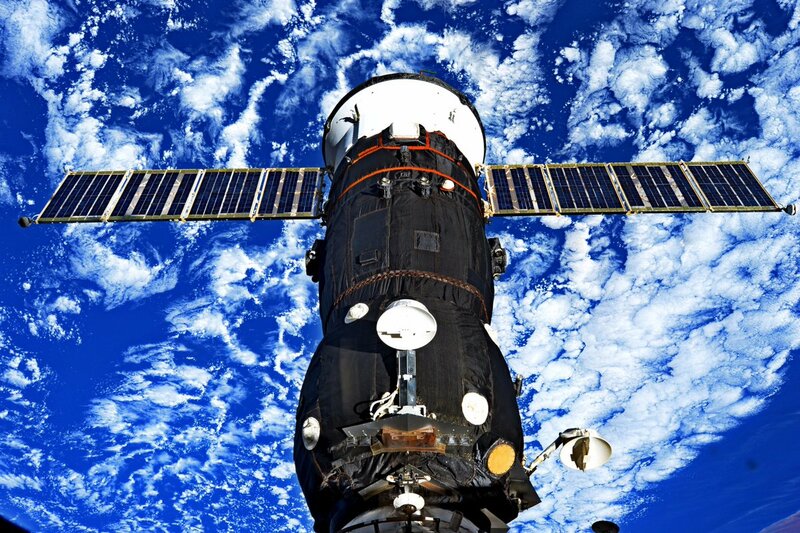 It's on one of the Russian modules of the ISS, that's why it's a ginormous Russian porthole. Since the porthole is facing Earth, I'd say yes, it's also facing the same general direction as the cupola, but not necessarily the same exact direction. @Steve the first cover is part of the pressure containment vessel of the station, note the mating seals around its rim and the seat of its closed position. If the glass of the porthole cracks or otherwise starts leaking, the first cover keeps the air in the station from all rushing out. The other cover is the access hatch in the inner walls of the ISS that define the bounds of normal day-to-day operation. The opinions expressed in this analysis are my own, YMMV. I guess "ginormous" is a matter of opinion - a 16 inch window doesn't seem to be that big - from here on the ground. Not the answer you're looking for? Browse other questions tagged iss progress spacecraft-window or ask your own question. Were there any STS missions that included maneuvers that might have photographed ISS's top side? What are the various propulsion systems on the ISS?